The Meteor F.4 was the result of three separate lines of research that began shortly after 616 Squadron had taken delivery of their F.1s in 1944. The Aerodynamic Section at R.A.E. Farnborough was studying ways to improve the high speed characteristics of the Meteor; wind tunnel tests indicated a breakdown of airflow around the engine nacelles at Mach .75, which resulted in a great increase in drag and severe buffeting, with the center section completely stalled. Further experiments demonstrated that these conditions could be delayed by increasing the chord - the length - of the nacelles in front of and behind the wings. Full scale trials on EE211 in November 1944 demonstrated a very useful increase in performance with the longer-chord nacelles. Secondly, development of the Derwent 5 - a smaller version of the excellent Nene jet engine - resulted in a doubling of available thrust as compared with the Welland. Thirdly, with the increase in power and aerodynamic cleanup, Gloster decided to go for a world's speed record. This was accomplished with a general clean-up and strengthening of the airframe; all of which was so successful that the result was ordered into production in November 1945 as the Meteor F.4. The first Gloster G.41F Meteor 4 was a modified F.3, EE360, which made its maiden flight on July 17, 1945. It showed a 111 m.p.h. increase in speed over the standard F.3. Airframe stress caused by this increase in speed was dealt with by clipping each wingtip by two feet, ten inches, which improved the rate of roll considerably, but raised take-off and landing speeds while reducing the rate of climb. Development of the T.7 with a longer fuselage went a long way to curing the directional instability of the early Meteors, and Gloster introduced a 30-inch fuselage extension immediately aft of the cockpit on the F.4. The F.4 did not completely replace the F.3 in front-line service until 1948, though the first production examples had reached squadron service in mid-1946. 539 F.4's were produced by Gloster, and 44 by Armstrong-Whitworth, who had entered Meteor production in 1946. The Meteor F.4 was the first of the type to be exported, and they served in the air forces of Argentina, Denmark, Egypt, Belgium and the Netherlands. They flew with the R.Aux.A.F. until the mid-1950s, serving alongside the later Meteor F.8 in these units. 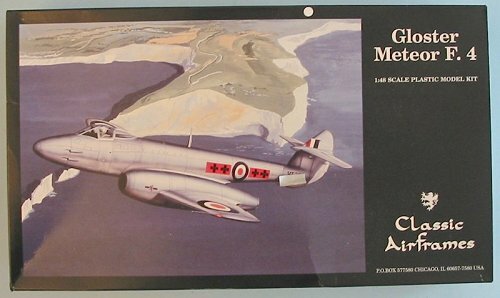 This kit represents the first injection-molded model of the Meteor F.4 to be produced since Frog released one in the late 1960s in 1/72 scale. 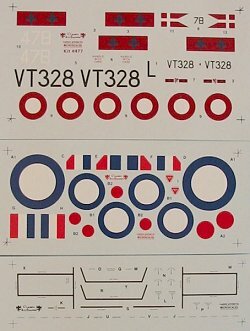 In 1/48 scale, it is the second kit of the F.4 to be available, with Aeroclub having produced a mixed-media kit in the mid-1990s. The kit shares the wing and resin detail parts with the earlier F.8 kit, with a different fuselage to cater to the F.4. 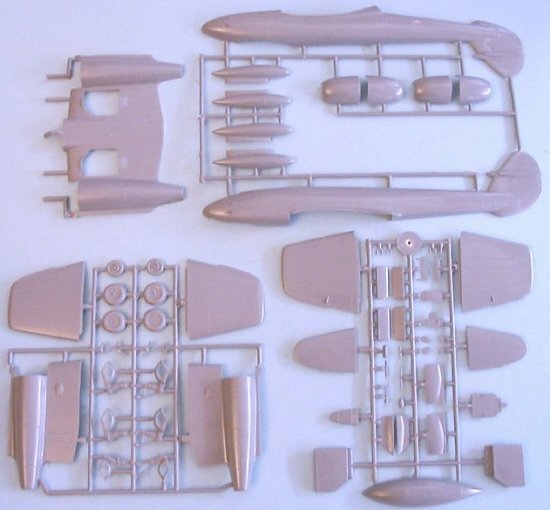 As with the F.8, the injection plastic is well made, and is very shiny - this should help modelers in getting the smooth final surface to the model that is crucial to getting a good silver finish, of particular importance since the Meteor F.4 was painted in High Speed Silver for all of its operational life with the RAF. The injection-molded canopy can be posed open. Decals are provided for a camouflaged F.4 of the Danish Air Force and a silver F.4 of 263 Squadron, RAF, in 1950 shortly after the re-introduction of colorful squadron markings. This kit looks to be every bit as good as the F.8 kit, and completes anyone's collection of single-seat Meteors. I personally like the looks of the F.4 over those of the F.8, making this a favorite that is going to jump to the top of the "To Do" pile.